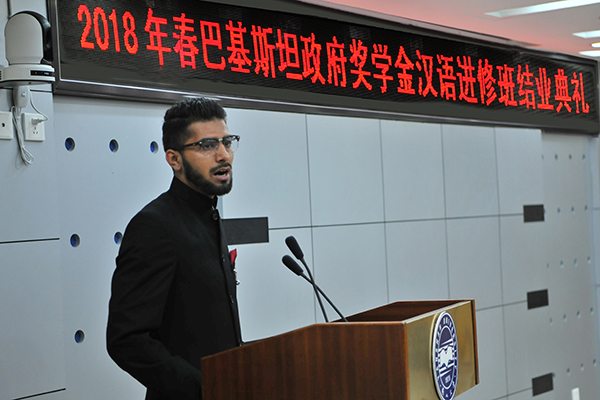 [News from the News Center] On the morning of June 30, YSU School of International Exchange holds Completion Ceremony for Pakistani Government Scholarship students in the lecture hall on the 18th floor of the Century Building. Vice President Zhang Fucheng and relevant leaders and teachers of the School of International Exchange attended the ceremony. 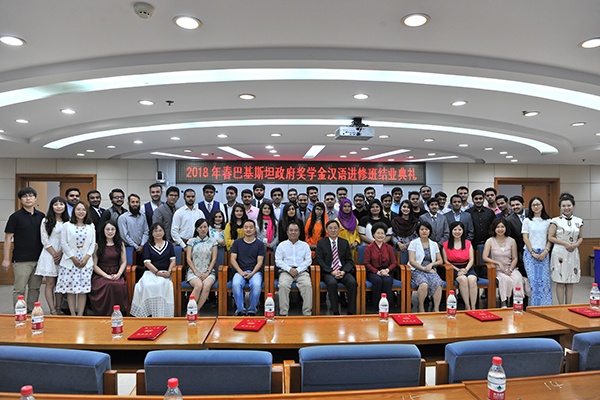 Zhang Fucheng awards Certificate of Completion for overseas students. 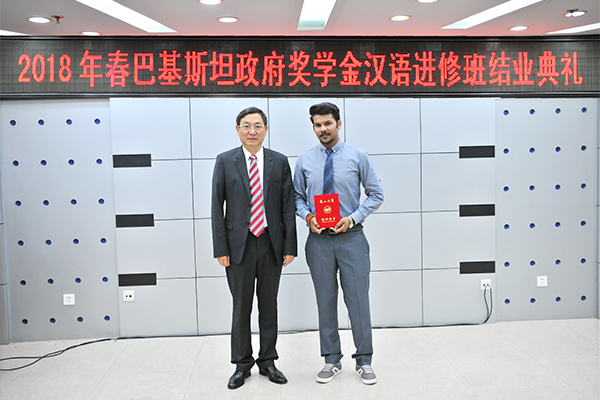 Zhang Fucheng awarded the Completion Certificates for the first batch of 39 Pakistani government scholarship Chinese language students and issued honorary certificates to 9 outstanding students. Teacher representative Li Xiaopeng speaks at the ceremony. Student representative Zhong Shi speaks at the ceremony. 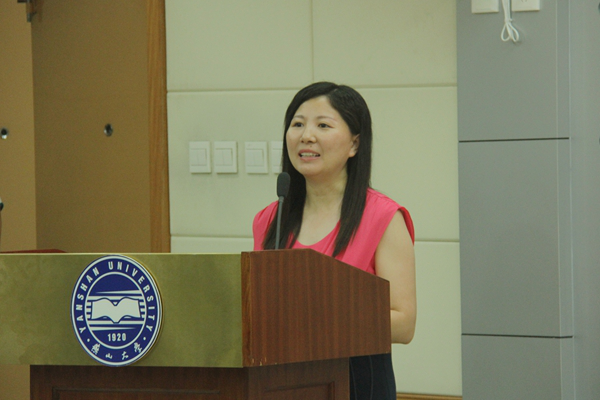 Teacher Li Xiaopeng gave a speech and shared the precious moments with the students over the past two years. She encouraged the students to continue to learn Chinese well after returning home. The outstanding student representative Zhong Shi also shared his remarkable life experience of studying Chinese language in YSU for two years. He thanked the school of International Exchange for two years, the care of the teachers, and the companionship of the students. He said that he will remember teachers and YSU after returning to motherland and strive to become an excellent cultural ambassador of Chinese and Pakistani culture. Zhang Fucheng speaks at the ceremony. 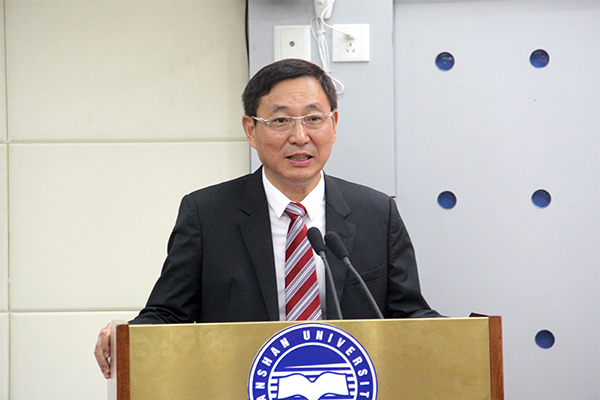 Zhang Fucheng delivered a speech at the ceremony. On behalf of YSU, he congratulated the Pakistani students on their achievements and strongly affirmed their enthusiasm and efforts in learning language at YSU. I wish them all the best and contribute to the construction of China and Pakistan. Photograph of teachers and overseas students. In October 2016, the first batch of Pakistani government scholarship students came to YSU for Chinese language training for a period of two years. Nowadays, they all pass the HSK5 oral test and have a high level of Chinese proficiency.